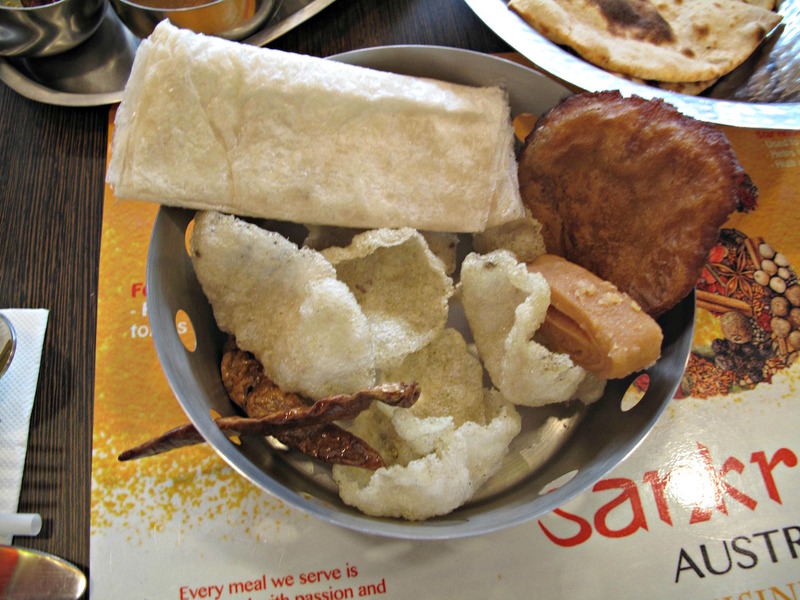 Sankranti has been open a few weeks, and in that time I’ve enjoyed some nice food south Indian – pooris, a biryani. But I’ve left it to do a story for the weekend the restaurant is doing a three days of special menus in celebration of the festival after which it is named. On the plus side, for me that means a beaut – and very photogenic – feed. On the down side, a one-off vegetarian feast can not be taken as representative of the regular menu. So let’s look at it this way – my Saturday lunch meal may not be what you’ll get on a regular visit here, but it is representative of the care and love that goes into the Sankranti food. The Saturday Sankranti deal costs me $29 (see details below). 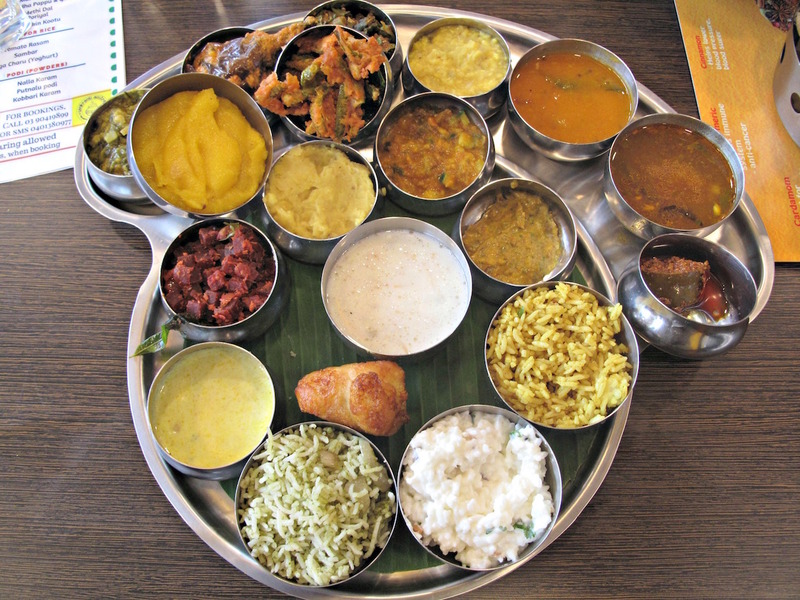 Quite a bit for a vegetarian thali, eh? I’m happy to pay up and eat, such is diversity of tastes and textures, some of them familiar, many of them new to me and even challenging. 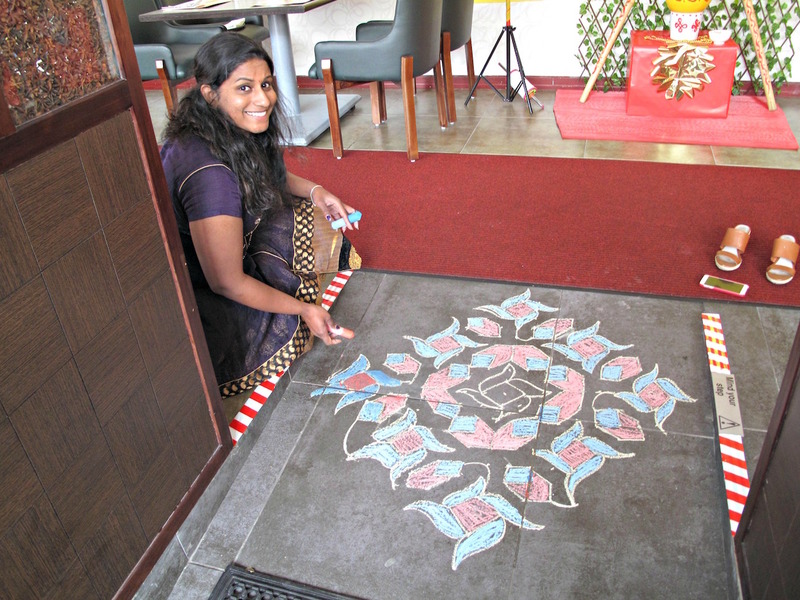 Latha talks me through some of the particulars and rituals normally involved with eating this sort of festive food. I even give the traditional eating order a go – sweets first, soup and yogurt last. The sweets don’t look very appetising, do they? Not so – they make lovely eating, though in quite a different way from more familiar Indian sweets such as kulfi. But a lifetime of culinary indoctrination of the soup/mains/sweets school is hard to kick. And the effort of mentally trying to match new and interesting names with specific dishes tumbles into the realm of information overload. So in the end, I just go with my own flow and enjoy the dazzling array before me. 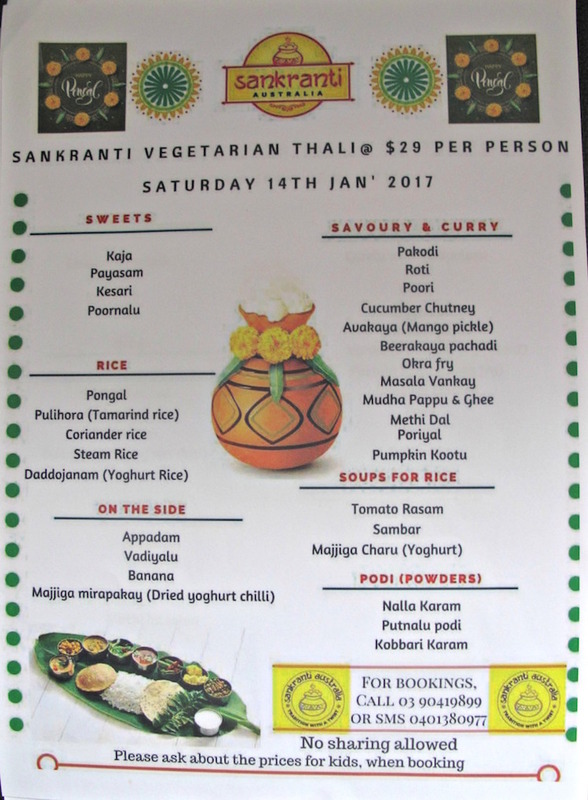 I especially like the rasam, the deep-fried and battered okra, the spicy coriander rice and the rice and vermicelli pudding that is payasam. This has been a humbling reminder that for all the Indian food I eat, in terms of regional diversity and a fabulously rich food culture, I am a mere beginner. ← Happy St Albans New Year!